Like other states, North Carolina traffic laws treat bicycles as vehicles and treat bicyclists as drivers of vehicles. 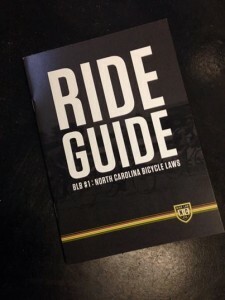 This article lists some of the most important traffic laws applicable to bicycle operation in North Carolina. For more detail and a list of all state traffic laws, consult the resources listed at the bottom of this article. NC Bicycle Laws on Vimeo. § 20-4.01(49) Vehicle. – …for the purposes of this Chapter bicycles shall be deemed vehicles and every rider of a bicycle upon a highway shall be subject to the provisions of this Chapter applicable to the driver of a vehicle except those which by their nature can have no application. As drivers of vehicles, bicyclists are allowed to travel on all public roadways except fully controlled access highways (freeways) such as interstates. NCAC 19A.2E.0409 OPERATING NONMOTORIZED VEHICLES: It is unlawful for any person to ride any animal, or to operate a bicycle or horse drawn wagon or any nonmotorized vehicle or moped on any interstate or other fully controlled access highway. § 20-4.01(23) Motor Vehicle. – Every vehicle which is self-propelled …. (2) A lamp on the rear, exhibiting a red light visible under like conditions from a distance of at least 300 feet to the rear of such bicycle, or the operator must wear clothing or a vest that is bright and visible from a distance of at least 300 feet to the rear of the bicycle. § 20-141. Speed restrictions. (a) No person shall drive a vehicle on a highway or in a public vehicular area at a speed greater than is reasonable and prudent under the conditions then existing. … (m) The fact that the speed of a vehicle is lower than the foregoing limits shall not relieve the operator of a vehicle from the duty to decrease speed as may be necessary to avoid colliding with any person, vehicle or other conveyance on or entering the highway, and to avoid injury to any person or property. § 20-140. Reckless driving. (b) Any person who drives any vehicle upon a highway or any public vehicular area without due caution and circumspection and at a speed or in a manner so as to endanger or be likely to endanger any person or property shall be guilty of reckless driving. § 20-146. Drive on right side of highway; exceptions. (a) Upon all highways of sufficient width a vehicle shall be driven upon the right half of the highway except as follows: (1) When overtaking and passing another vehicle proceeding in the same direction under the rules governing such movement; (2) When an obstruction exists making it necessary to drive to the left of the center of the highway; provided, any person so doing shall yield the right-of-way to all vehicles traveling in the proper direction upon the unobstructed portion of the highway within such distance as to constitute an immediate hazard; (3) Upon a highway divided into three marked lanes for traffic under the rules applicable thereon; or (4) Upon a highway designated and signposted for one-way traffic. § 20-158. Vehicle control signs and signals. (b) Control of Vehicles at Intersections. – (1) When a stop sign has been erected or installed at an intersection, it shall be unlawful for the driver of any vehicle to fail to stop in obedience thereto and yield the right-of-way to vehicles operating on the designated main-traveled or through highway. When stop signs have been erected at three or more entrances to an intersection, the driver, after stopping in obedience thereto, may proceed with caution. (2) a. When a traffic signal is emitting a steady red circular light controlling traffic approaching an intersection, an approaching vehicle facing the red light shall come to a stop and shall not enter the intersection. After coming to a complete stop and unless prohibited by an appropriate sign, that approaching vehicle may make a right turn. b. Any vehicle that turns right under this subdivision shall yield the right-of-way to: 1. Other traffic and pedestrians using the intersection; and 2. Pedestrians who are moving towards the intersection, who are in reasonably close proximity to the intersection, and who are preparing to cross in front of the traffic that is required to stop at the red light. § 20-146. (d) (1) A vehicle shall be driven as nearly as practicable entirely within a single lane and shall not be moved from such lane until the driver has first ascertained that such movement can be made with safety. § 20-153. Turning at intersections. (a) Right Turns. – Both the approach for a right turn and a right turn shall be made as close as practicable to the right-hand curb or edge of the roadway. (b) Left Turns. – The driver of a vehicle intending to turn left at any intersection shall approach the intersection in the extreme left-hand lane lawfully available to traffic moving in the direction of travel of that vehicle, and, after entering the intersection, the left turn shall be made so as to leave the intersection in a lane lawfully available to traffic moving in the direction upon the roadway being entered. § 20-149. Overtaking a vehicle. (a) The driver of any such vehicle overtaking another vehicle proceeding in the same direction shall pass at least two feet to the left thereof, and shall not again drive to the right side of the highway until safely clear of such overtaken vehicle. This subsection shall not apply when the overtaking and passing is done pursuant to the provisions of G.S. 20-150.1. 20-146. Drive on right side of highway; exceptions. (b) Upon all highways any vehicle proceeding at less than the legal maximum speed limit shall be driven in the right-hand lane then available for thru traffic, or as close as practicable to the right-hand curb or edge of the highway, except when overtaking and passing another vehicle proceeding in the same direction or when preparing for a left turn. A bicyclist may use a full marked lane. “Bicyclists usually ride on the right side of the lane, but are entitled to use the full lane…. Drivers wishing to pass a bicyclist may do so only when there is abundant clearance and no oncoming traffic is in the opposing lane. When passing a bicyclist, always remember the bicyclist is entitled to use of the full lane.” – North Carolina Driver’s Handbook, p.95. § 20-141. (h) No person shall operate a motor vehicle on the highway at such a slow speed as to impede the normal and reasonable movement of traffic except when reduced speed is necessary for safe operation or in compliance with law; provided, this provision shall not apply to farm tractors and other motor vehicles operating at reasonable speeds for the type and nature of such vehicles. § 20-138.1. Impaired driving. (a) Offense. – A person commits the offense of impaired driving if he drives any vehicle upon any highway, any street, or any public vehicular area within this State: (1) While under the influence of an impairing substance; or (2) After having consumed sufficient alcohol that he has, at any relevant time after the driving, an alcohol concentration of 0.08 or more. The results of a chemical analysis shall be deemed sufficient evidence to prove a person’s alcohol concentration; or (3) With any amount of a Schedule I controlled substance, as listed in G.S. 90-89, or its metabolites in his blood or urine. § 20-171.9. Requirements for helmet and restraining seat use. With regard to any bicycle used on a public roadway, public bicycle path, or other public right-of-way: (a) It shall be unlawful for any parent or legal guardian of a person below the age of 16 to knowingly permit that person to operate or be a passenger on a bicycle unless at all times when the person is so engaged he or she wears a protective bicycle helmet of good fit fastened securely upon the head with the straps of the helmet. (b) It shall be unlawful for any parent or legal guardian of a person below the age of 16 to knowingly permit that person to be a passenger on a bicycle unless all of the following conditions are met: (1) The person is able to maintain an erect, seated position on the bicycle. (2) Except as provided in subdivision (3) of this subsection, the person is properly seated alone on a saddle seat (as on a tandem bicycle). (3) With respect to any person who weighs less than 40 pounds, or is less than 40 inches in height, the person can be and is properly seated in and adequately secured to a restraining seat.